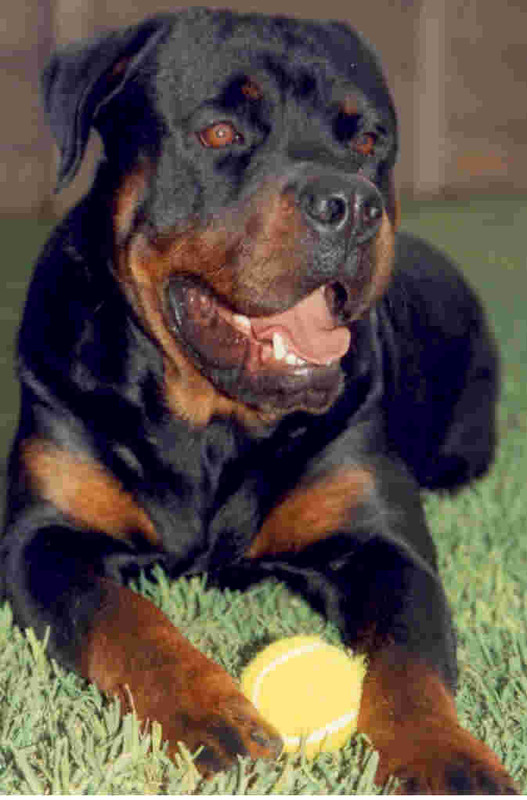 The Rottweiler originated in the town of Rottweil in Germany. He is thought to have been bred for herding and guarding cattle. Click here to read the origin of dog breeds. Your Rottweiler puppies for sale could go here! Rottweilers are massive dogs, strong and powerful. They need careful rearing as puppies and must be made to obey their master. They are intelligent, obedient and trainable. A Rottweiler would not make a suitable pet for a little old lady because of its strength. Nor should children be allowed to take the dog out for walks by themselves. The dog can overpower them. But the dogs are fond of children. Temperament: Good natured, placid, devoted, and eager to work. Rottweilers need a large garden with a strong fence. They make alert watch dogs. Their sheer size is enough to intimidate people! Coat: The topcoat is medium length, coarse, dense and flat. The undercoat must not show through the topcoat. Colour: black with specific tan markings on cheeks, muzzle, throat, chest, legs, over both eyes, and under the base of tail. Height: males 61 - 68 cms at shoulder, females 56 - 63 cms. Tail: It used to be fashionable to cut off puppies' tails, leaving a stub. If you're buying a Rottweiler puppy, you can ask the breeder not to amputate (dock) your puppy's tail. FCI Class: Group 2 - pinscher & schnauzer type, Molossian type, Swiss mountain, & cattle dogs. 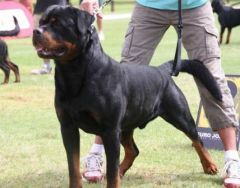 Rottweiler Breed Council automatically impose breeding restrictions that you can't register puppies if the parents do not comply with specific healthy breeding codes. Some people buy Rottweilers for the wrong reason. They want to be macho and have a dog that's a bully. It's not OK to let our dogs terrorise innocent people. A Rottweiler needs to be taken to training class. If people are frightened by a big, bully dog, they may retaliate by throwing stones. There was a man called Goliath in the Bible. He was a bully because of his size. He provoked people. But a youngster called David threw a stone at him which hit him on the head and killed him. Then Goliath couldn't terrorise people any more. 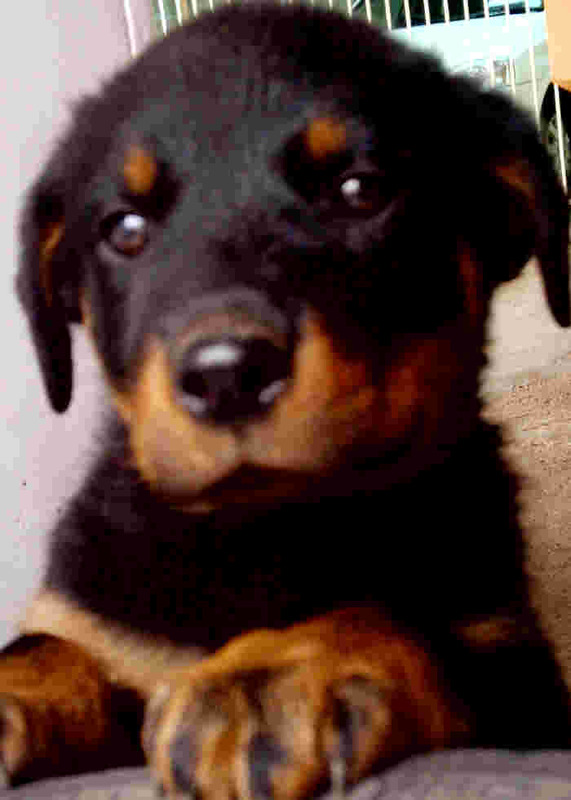 Read about Thor the Rottweiler.